This is the view of the cottage from the driveway that leads down to the residence. 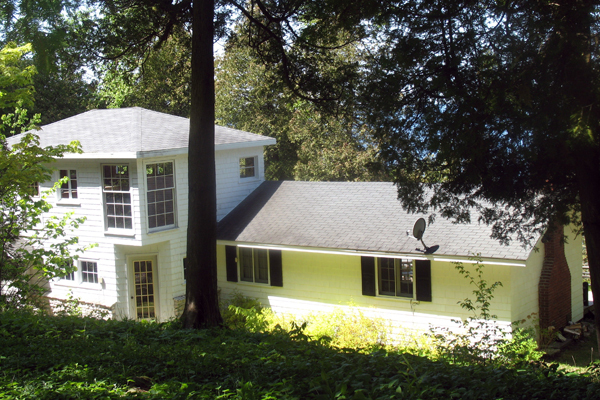 As you can see, the house is quite secluded; it is set-back in the woods and perched on a bluff overlooking Lake Michigan. There are stairs which lead down to the pristine rocky beach below. Extremely quiet and very private! This is the front view of the charming cottage. It faces beautiful Lake Michigan and because of the way it is situated, it gets almost constant sunlight. Countless guests have passed their days relaxing on the deck. Lounge chairs (not shown) are included for maximum relaxation. This is the long driveway, leading from the main road, MacDonald Road on Washington Island. 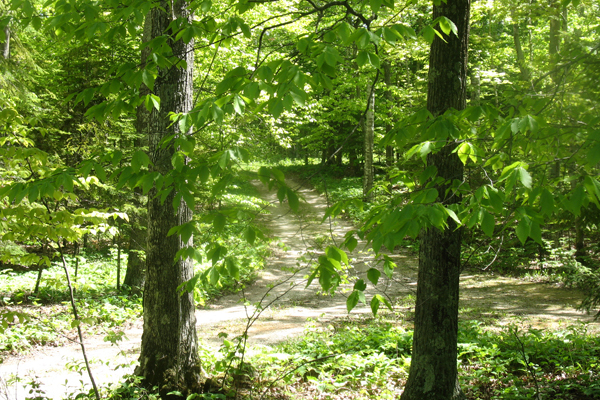 It is less than a minute's drive to the cottage but, is all you need to put you "off the beaten path". 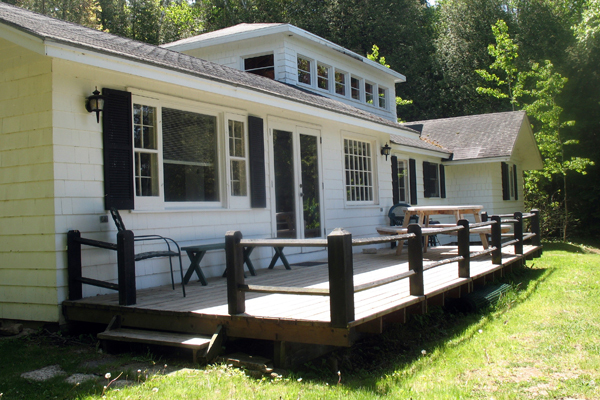 Privacy is one of the key features to this fantastic Wisconsin cottage rental! Hardwood floors throughout the living and dining areas make this Wisconsin cottage rental all the more cozy. 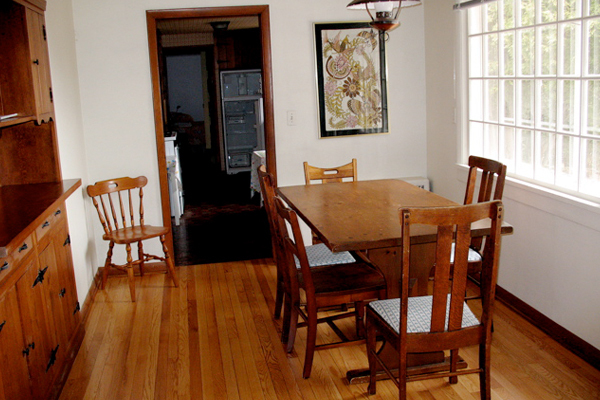 The dining room table can seat 6 comfortably and has gorgeous views of Lake Michigan. The living room is open and adjacent to this dining area. A perfect set-up! This is absolutely a one-of-a-kind Wisconsin cottage rental, Above & Beyond has 300 feet of private and very secluded beach. The water is Lake Michigan-crystal-clear, right through to the rocky bottom. It's a great place to swim, fish, sunbath or just catch up on some sleep while hanging out with friends and family. 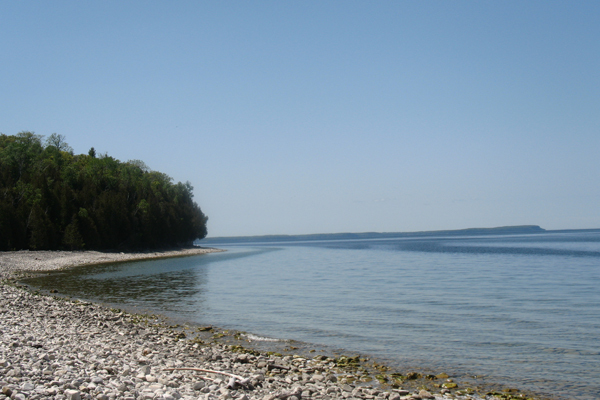 Come follow the breeze off the northern tip of Wisconsin's Door County Peninsula to a special island retreat... to a snug cottage high above a white stone beach where spindly-legged gulls skitter along, and the view at any time of day or night takes your breath away. If it sounds too good to be true, just follow the gentle breeze, let us prove it to you. As you watch the sun slowly slide into the water's horizon, you'll be glad your cottage is on the desirable west side -- the sunset side -- of historic Washington Island. The gentle lapping of waves will lull you to sleep, and you'll wake to the fresh scent of the cedar and pine forest. Reach out to glorious vistas as you travel around the island's 26 square miles... hike untrodden paths... swim, fish, ride the waves... sail, kayak, canoe, or bike... visit distinctive shops and galleries featuring regional products and artists. A short, 35-minute car ferry ride from the mainland, it is a getaway in the truest sense of the word to a place full of natural wonders and a sense of incomparable tranquility. And yet, all the comforts of home and community are within easy reach. Your Wisconsin cottage rental - Above and Beyond - will give you the privacy you seek without sacrificing comfort and convenience. Share this magical, intimate place surrounded by the great, glistening waters of Lake Michigan with those you love for a special vacation guaranteed to renew and refresh. "We came here to get away & now we don't want to go away. Awesome! Sure worth the money. I can't stay in a motel again. We'll definitely be back." "This cozy Wisconsin cottage rental with its phenomenal sunsets make it the perfect getaway." "'Above and Beyond' is certainly an appropriate name for this wonderful cottage! Just being here made my stress fade away and memories of those spectacular sunsets will remain for many months. Thank you so much!" "It was like being in the little cabin on the Lake Innisfree. Such magical light here!" "A beautiful tranquil place. Waves splashing against the shore... sunsets that fill your heart & soul."